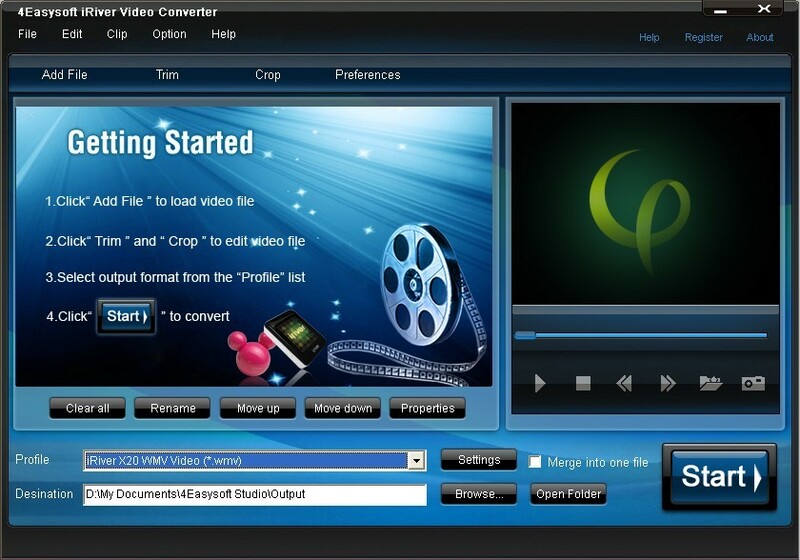 To create iRive video in your own way, this best iRiver Video Converter also offers you rich video editing functions such as video cropping, movie trimming and video joining. Due to the user-friendly interface and powerful conversion engine, only a few clicks are all you need to enjoy high-quality favorite clips on iRiver e100, h10, X20,etc. WMV, MP4, MOV, M4V, AVI, FLV, 3GP, 3G2, MPG, VOB, MPEG, ASF, MOD, MKV, RM,TOD, MPV, TS, M4A, MP3, WAV, WMA, AC3, MP2, APE, RA, MID, etc. 4Easysoft iRiver Video Converter can be used for various iRiver players including iRiver X20, iRiver B20, iRiver Clix, iRiver DP350, PMP-100, etc. Video editing functions like video cropping, movie trimming, and output settings (including resolution, bit rate, frame rate and sound channel, etc.) are available. You're in control of your favorite clips.